How many times do you use a faucet or flush a toilet each day? When you’re shaving or putting on makeup in the morning, when you’re cooking dinner in the evening, or when you’re getting ready for bed at night, your home’s plumbing comes into play. You count on your sinks, faucets, and drains to provide clean water and carry wastewater away. If something goes wrong with your pipes, you need a team of local plumbers who can help. At Gladiator Repipe, we’re proud to serve Cotati and we can take care of any issue within your home. Our main service focuses on taking care of those old pipes in your house that are causing problems. 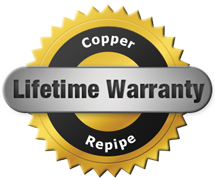 If rusted or blocked galvanized pipes are creating headaches in your bathroom, kitchen, or laundry room, we can replace them with state-of-the-art PEX or copper piping. PEX and copper can last for several decades, and you shouldn’t have to worry about low water pressure or inadequate hot water anymore. Repiping may be our specialty, but it’s not the only service we offer. We can also repair or replace your old water heater that just can’t keep up any longer with your family’s hot water demands. We’ll check your current appliance to see if it’s still viable for a few more years, and if it isn’t, we’ll recommend the best upgrade that fits your budget. We can also provide professional drain cleaning and sewer repair, so if there’s a major clog that’s causing problems, or you’ve noticed a low or soggy spot in your yard, give us a call right away. As your local plumbers, we can find the issue quickly and fix it in no time at all.